Protects your TV against Android security issues including ransomware attacks. Every connected USB device will be checked first to prevent malware accessing your Smart TV. Helps you to stay secured from unauthorized access and misuse of your data while you are connected. The Internet of Things (IoT) is an interconnected network of various smart devices, including mobile phones, home appliances, cars or TV devices, which are able to communicate between each other online. As soon as any of your technology becomes connected, it requires reliable internet protection. 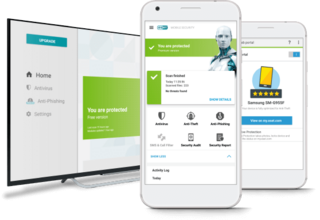 With the premium license of ESET Smart TV Security, you can also activate the premium version of ESET Mobile Security for your Android smartphone and tablet under the same Google account and vice versa. If you have Google Play Store on your TV, your OS is Android. Android TV is supported by these manufacturers : Sony, Philips, Asus, B&O, Bouygues Telecom (Bbox Miami), CCC Mobile (Air Stick), Free/Iliad (Freebox Mini 4K), LeEco (Super4 X Series), NVIDIA (Shield TV Console), RCA, Sharp, TCL, Xiaomi (Mi Box) and others.